Today's chilly cold temps (for Seattle!) 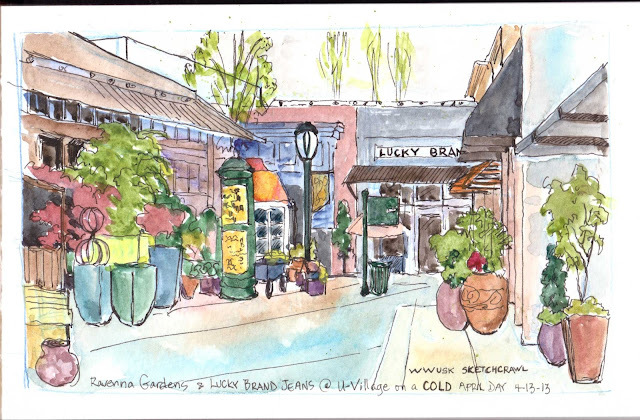 didn't stop a group of 15+ of us USkers when we met at the University Village today to sketch in concert with Urban Sketchers worldwide. While most of us stayed outside to sketch iconic views of the Village, already bustling with shoppers and UW students...I, however, have become a wimp! so I found a great spot INSIDE the Red Mango Shop, looking north, towards Ravenna garden store and Lucky Jeans. Ahhhhh. Lovely sketch and color contrasts..it must be spring..somewhere! !